This is principally for VFR flight and also includes Customs/Immigration documentation and even lifejacket rental information. 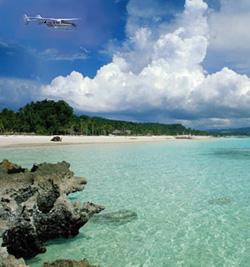 Although it's for a flight to Great Harbour Cay, it may be used as a model to fly to any Bahamian out-island. Before getting into the Bahamas flight info, please note that the most challenging part of your cross-country trip is the leg from your home airport to So. Florida. You got that right -- the hop from Miami to Great Harbour Cay (GHC) is a breeze compared to your flight from home to So. Florida. So, plan your domestic flight carefully. Several days before departure study up-to-date sectionals. Get latest NOTAMs. Avoid Prohibited and Restricted Areas, as well as TFRs, MOAs and Class B. Plan your refueling stops conservatively (I like www.airnav.com to find best fuel prices). Just prior to departure check weather carefully. Filing a flight plan and using flight-following are highly recommended. For your whole trip (including the Bahamas section) remember to monitor 121.5. For the Florida-to-Bahamas leg, note that VFR flight at night is prohibited. Reading my Ditching: Avoid & Prepare page is recommended, but since your over-water hop is never outside 50 nm from land, you might choose to disregard some of the suggested preparations (but an aviation lifejacket, although not required by regulations, is a must and can be rented at TMB). The figure below may help you visualize the procedures. You must get a decal for Customs for your aircraft. You must file an electronic APIS (eAPIS) with U.S. Customs for the flights. Prior to leaving GHC, you call Customs at TMB to give them your arrival time. On return, you use a special squawk code. That's it. It's that simple. The procedures below seem lengthy for two reasons. First, they include all of the procedures for the flight, including the common ones you use in domestic flights. Second, it's full of details, not just frequencies and backup frequencies but where to find a phone at GHC to file your return plan, even what to say to ATC. Before Flight. Your first two steps, which can be done days or weeks in advance, are a) to get a Customs decal for your airplane (search DTOPS in Google; if your flight is before you receive the decal, your printed receipt is accepted in lieu of the decal when returning to the U.S.), and b) to file the eAPIS for both flights with U.S. Customs (forget what you may have heard -- it's now quite painless, see Footnote 1). Next, do thorough flight planning, get a full briefing and file an international VFR flight plan direct to GHC at a recommended altitude of 5,500 or 7,500 ft. (filing the return flight plan at 4,500 or 6,500 ft. is highly recommended). At TMB put sufficient fuel (plus margin) for a 3-hour flight or more if sightseeing, headwinds or weather deviations are possible (no fuel at GHC) and rent or check your lifejackets. Flight Following. Highly recommended. Request it from TMB Ground before taxiing, enter the squawk code Ground gives you, then, after you open the flight plan (next step), call Miami Departure on 125.5 . Open Flight Plan. Do it at about 1,000 ft altitude, after requesting a frequency change from the TMB Tower, by calling Miami Radio on 122.2 or 126.7. Stay Outside MIA Class B. Fly below 3,000 ft for the first 15 miles or so, to stay under MIA Class B airspace unless Flight Following allows you entry. Cancel Flight Plan. Do it in between above transmissions, when you have a clear view of GHC (even if MYBG is still not discernible) but above 3,000 feet if possible, by calling Nassau Radio on 128.0 (if you are unsuccessful, try Nassau Approach on 121.0 or tell Bahamas Customs upon landing). 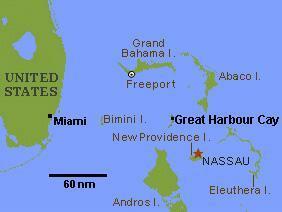 I like to ask Nassau Radio for wind conditions at Nassau, so I can plan whether to use runway 13 or 31. Immigration and Customs. After landing, each U.S. citizen will need to show whatever is needed to re-enter the U.S. (see point 8 in "Returning"), each person will need to fill out a simple form, and the pilot will need to fill out a second form (all forms provided there). There is a landing fee of $58 (per airplane) but no tie-down fees. (Arrivals before 9AM or after 5PM incur an additional overtime fee of around $50 per airplane). Before Flight. At MYBG there is free wi-fi to get flight info (TAF, radar, satellite, etc.) and a toll-free, direct-connect phone to call the Miami FSS to get a briefing and, if you didn't do it from the U.S., to file your international VFR flight plan to TMB (recommended altitude is 4,500 or 6,500 ft.). This phone also connects directly to the TMB Customs office, for you to call and give them a Flight Arrival Report. Finally, the pilot will fill out a Bahamian Customs form identical to the one he/she filled out on arrival and each person pays a $25 departure fee. Prior toTake-Off and During Climb. Self-announce on 122.8, transmitting your location/altitude/intentions and asking for traffic in the area. Open Flight Plan and Get Customs Squawk Code. Do it at 3,000 ft (might have to try a little higher, if unsuccesful), by calling Miami Radio's Nassau tower on 118.4 (since this squawk is critical, see footnote 2 for an alternate solution if you can't raise Miami Radio on 118.4). Enter this critical squawk code (which grants you entry into U.S. airspace) in your transponder and check that the transponder is ON and working by looking for the light flashes. You must be squawking the assigned code before crossing the outer ADIZ line. Do not cross this ADIZ line without it! Monitor Miami Radio and 121.5. If you choose not to get Flight Following (next step), stay monitoring Miami Radio on 118.4 until it weakens East of Bimini, then monitor it on 126.7. Also monitor 121.5. See footnote 3. Flight Following. After you're squawking the Customs code, if you want Flight Following to approach the U.S., call the Miami Center frequency you used just west of GHC on the outbound leg and request it like this: "We're currently squawking wxyz for Customs identification and would like flight-following to Tamiami". If they can handle you, they'll assign you a new code. Approaching Airport. Follow proper procedures, staying outside MIA Class B (unless authorized) and making sure that you get the TMB ATIS and call the tower. Cancel Flight Plan. Do it by calling Miami Radio on 122.2 when you are in sight of the airport (ask permission of the tower to change frequency for a couple of minutes). If you can't do it in flight, ask Ground Control if they will do it or call 1-800-WX-BRIEF promptly. Immigration and Customs. After landing, each U.S. citizen will need to show a valid U.S. passport, each family will need to fill out a simple form, and the pilot will need to show valid pilot's license, medical certificate and aircraft registration. They are only open until 6 PM (7 PM during Daylight Savings Time), and you should arrive at least an hour earlier. You can do it directly with the government site at no cost (it's a reasonably user-friendly site) or you can register your aircraft and pilot on that site and then use Flashpass to do the filing for the trips (it's $2 or $3 per trip; use Flashpass.net with a computer or tablet, or the Flashpass app from a smartphone). An alternate is to open the flight plan with Nassau Radio on 128.0 as soon as you can, then start trying 126.7 (Miami Radio's tower in Miami) 20-30 miles before getting to Bimini, and ask Miami Radio for the Customs squawk code. As indicated above, do not cross the outer ADIZ line (which is just West of Bimini) without this code. Failure to raise Miami Radio on 118.4 has never happened to my knowledge, so you shouldn't be concerned, but I always like to have a backup. If your transponder fails, it's critical that you be monitoring these two frequencies. Unauthorized aircraft or those with inoperable transponders are called on 121.5 or Miami Radio frequencies by location/direction/speed ("aircraft at 25.4 lat, 78.8 long, on a course of 92 deg, at 145 knots, contact ATC on xyz frequency"). Usually, even with a bad transponder, they'll let you into U.S. airspace if you report in, your aircraft was assigned an entry squawk code, you do some maneuvers directed by ATC so they locate you on radar, and you stay under active ATC control into TMB.